Breadth-First Search (BFS) is the underlying kernel algorithm for many graph applications such as social networks, medical informatics, transport systems, etc. Therefore, it has been absorbed as a core of Graph500, used to evaluate the capability of supercomputers in terms of big data processing. 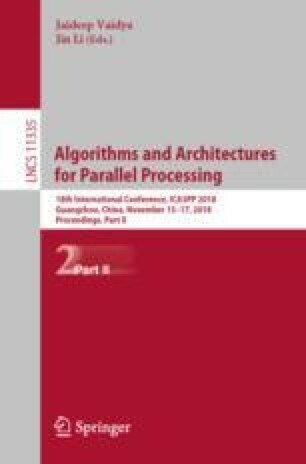 In this paper, we introduce into a global bitmap which is used to accelerate two approaches: the top-down and bottom-up. Specifically, the new top-down approach uses the global bitmap to indicate whether the vertices are visited or not, while the new bottom-up approach changes the frontier queue to the global bitmap to indicate whether the vertices are on the frontier. With the help of the global bitmap, the total number of communication messages produced by the BFS will be reduced significantly, and consequentially the BFS is accelerated. Meanwhile, our algorithm is optimized for storage on Knights Landing (KNL). We evaluate our proposal on both the KNL platform and the Tianhe-2 supercomputer. Experimental results demonstrate that the communication was time reduced to roughly 1/4 of the original. We obtain speedups of 2.2–3.1 compared to the top-down approach. This research was supported by the National Key R&D Program of China under NO. 2018YFB0203904, NSFC: U1611261, NSFC: 61433019, NSFC: U1435217 and the Program for Guangdong Introducing Innovative and Enterpreneurial Teams under Grant No. 2016ZT06D211.